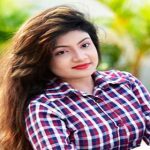 Mahiya Mahi is a popular film actress in Bangladesh who expands popularity extremely within a short time in showbiz arena. She comes in the film industry with acting in her debut film Balobashar Rong at the early of his age. She is now popular, well known, heartthrob and dream girl to the young generation in the country. Mahi was born on 27 October 1993 in Rajshahi where she passed her childhood. She joined Uttara High School and College and passed SSC with GPA 5. Then she enrolled at Dhaka City College and completed Higher Secondary Certificate with also (golden) GPA 5. Now she is studying Fashion Designing at the Shanto-Mariam University of Creative Technology. Undoubtedly, she is a brilliant student beside a brilliant film actress. Originally Mahi had no intention to become a film actress but she wanted to be a doctor seriously. However, she was fascinated about modeling that’s why she had a photo shoot which was submitted in Jaaz Multimedia via her friend. Dramatically, Jaaz Multimedia chose her as a newcomer face in the Dhallywood industry. Then Jaaz called her for their country first digital movie ‘Balobashar Rong’. In this film, she showed her terrific performance which attracts seriously everyone. Followed by she acted in ‘Onnorokom Balobasha’, ‘Poramon’, ‘Balobasha Aj Kal’, ‘Tobuo Balobashi’. Among this film, she showed her wonderful performance in the ‘Poramon’. Now she is a commercially successful film actress in the country and director have to pay the highest rate for a movie in the history of the country film industry. She takes 1 million takas for per film which has broken all the previous records. Even Moushumi, Shabnur, Purnima and Apu Biswas didn’t get such a highest rate. Mahiya Mhai tied a knot with a businessman from Sylhet on May 12, 2016. Her husband name is Mahmud Pervez Opu, they married in a family ceremony at Uttara residence, and later Mahi exposes the news by uploading a wedding photo on social media. She is very much happy with her husband who is kind hearted and ordinary man. After marriage, Mahi’s ex-friend Shahriar Islam Saon uploaded some intimate photo with Mahi on the social media. Saon’s claim Mahi is his wife, they married 15 May 2015 but Mahi refused the accusation. She filled a case against Saon in ICT law for the uploading intimate photo on Facebook. Later, two families settle down the dispute between Mahi and Saon by signing an agreement. Mahiya Mahi nominated for Best Heroine category in Meril Prothom Alo Awards for film ‘Onnorokom Balobasha’. Amar jiboner akta bodho sopno,mahiya mahi k sorashori dekher r jodi kokhono dekhi shudhu akta kotha bolbo tomake keno ato valo lage so ato valobashi plz ans daw.love is life,life is mahi. You are heavy lucky girl for lifestyle..Second time who aren’t birth like you/ mahiya mahi..You are my classmate..
Mahiya mahi ar aro chabi chai. Her acting very nice & she’s everything mindbloing. If you don’t mind, you will be my friend. I like you so much & love you very much.